In a Salesforce Marketing Cloud email message, the header is the "View online" link at the top, and the footer is content that appears at the bottom. If your HTML paste designs have coded headers, create "Delivery Profiles" to match (header=none). 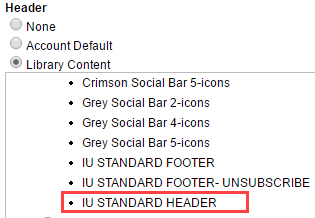 If you use a template or are building your own header using HTML, consider using IU Standard Header in Library Content, located in the Shared Content > IU Global Template Assets folder. Otherwise, refer to the codes and requirements in Salesforce Marketing Cloud dynamic codes. Account default is not the best option; it is not formatted. You can copy the HTML, edit, and save these examples in your own My Contents folder. Keep in mind that those codes need to be present in some form in order to send your email message from the Marketing Cloud. If your HTML paste designs have coded headers or footers, create "Delivery Profiles" to match (footer=none). 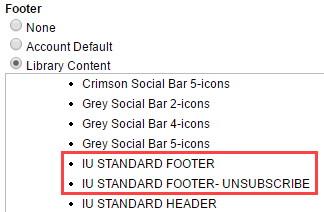 If you use a template or you are building your own footers using HTML, consider using formatted code in Library Content, located in the Shared Content > IU Global Assets folder. Otherwise, refer to the codes and requirements in Salesforce Marketing Cloud dynamic codes.